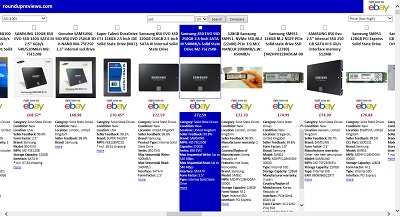 Use our new and improved custom search feature to make choosing between very similar items such as memory cards, USB sticks and hard drives simple. Now choose from up to 100 items which can be sorted, filtered and individually compared. roundupreviews.com is happy to announce that 'Quick, easy, side-by-side comparisons' has become an eBay Compatible Application, for which we wish to thank the staff at the eBay Developers Program for their time and consideration. The eBay Developers Program provides an open and easy-to-use development platform which enables third-party developers to create innovative solutions for eBay users, such as 'Quick, easy, side-by-side comparisons'.